T3 Motion, Inc. ("T3 Motion" or "the Company") engages in the design, manufacturing, and marketing of electric vehicles, specializing in cost-effective transportation solutions for professional and consumer markets. T3 Motion's flagship product is the T3 Series electric stand-up vehicle (ESV), a zero-emission, three-wheel unit designed for law enforcement and security operations yet flexible enough for government and consumer applications. T3 Motion designed its electric stand-up vehicles to emphasize both the environment and cost-efficiency, meeting stringent performance standards and enhancing the image of the professional while requiring less than an estimated $0.10 per day to operate. T3 Motion plans to capitalize on the T3 Series' modular design to introduce new products based on the T3 Series platform. The Company introduced the T3 Series consumer version—the T3 Power Sport—in December 2011, as well as the T3 Non-Lethal Response Vehicle (NLRV) in October 2011, designed for crowd control operations. In April 2011, the Company also introduced the R3 Series prototype, a two-passenger vehicle for the consumer market. About 3,000 T3 Series vehicles are currently used by 700 customers worldwide, including 180 cities, municipalities, and police departments, over 50 airports and ports, the Pentagon, CIA, and FBI buildings, the New York Subway system, Amtrak railroad, and military installations. The T3 Series electric stand-up vehicle has facilitated security at the Tour de France, Rose Parade, Super Bowl XLV, G20 Summits, and Grand Prix Formula One races, among other events. 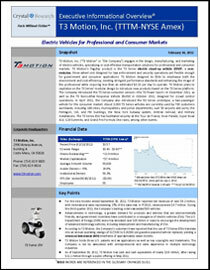 * The Corporate Snapshot was last updated on February 14, 2012.